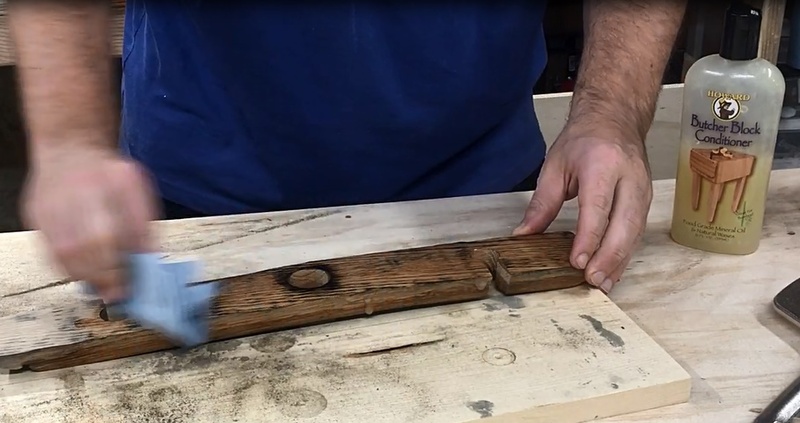 I’ve always wanted to build some things out of barrel staves and this was the easiest thing I could think of to get started. Dimensions and a drilling and cutting template can be downloaded by clicking the button below. (The template is slightly smaller than the dimensions when printed but it still will show you where to drill and cut accurately) There are also affiliate links at the bottom of the article to all the tools and items I used in this project, including the barrel staves. Or just click the button below to buy it from me. I picked up a three pack of barrel staves which actually came from a whiskey barrel. 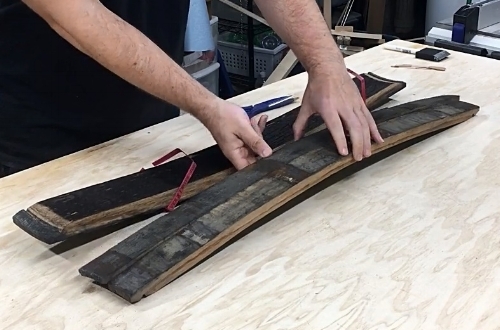 There really isn’t much difference between whiskey barrel stave and a wine barrel stave other than the inside color and the smell. The process is pretty simple, I cut one stave, to 11 inches, at 45 degrees to match the opposing end. Some people just cut off both ends. Then found the balancing point using a wine bottle. 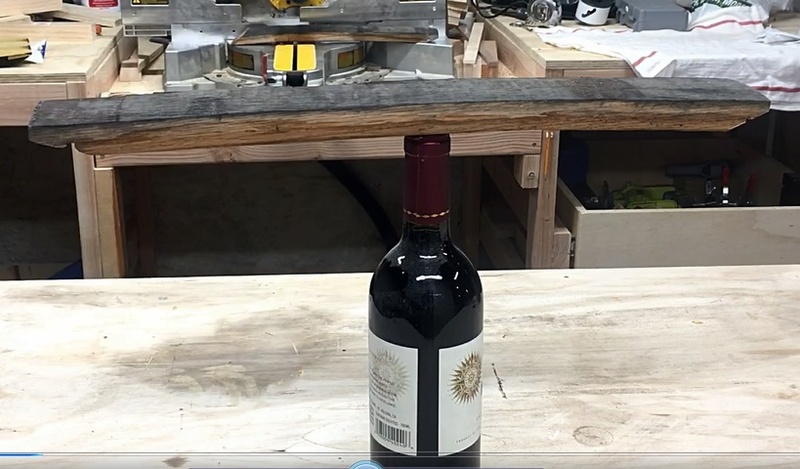 After finding the center I drilled a hole using a 1-1/2 inch Forstner Bit to sit on the neck of the wine bottle. Then I drilled smaller holes several inches down on either side where the glassed will rest. The drilling was by far the best part, it made my entire shop smell like whiskey. To insert the wine glasses, I measured the width of the wine glass stem and cut a notch on opposite sides of each end. This was done using a jigsaw but could easily be done with a handsaw as oak cuts fairly easily and the cuts aren’t too deep. Finally, I sanded like crazy to remove all the weathering. I alternated between a belt sander and orbital sander depending on where I was sanding. It took awhile but removing most of the weathering gives it a better look. After sanding it was time to add some finish. I just went with some butcher block conditioner because I have it on hand, it’s food safe and it’s easy to apply.